One of history’s most influential rulers became queen just out of girlhood and led her country during a time of great change. 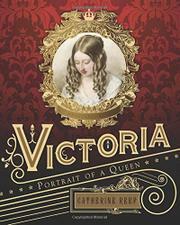 Victoria, until recently Britain’s longest-reigning monarch, became queen through a series of tragedies and accidents. Her father, the Duke of Kent, died when she was an infant, so she and her German-born mother moved into Kensington Palace, where Victoria grew up as part of the royal family but suffered the machinations of her mother and her late father’s assistant. Although Victoria was just 18 when she became queen, she was old enough to act on her own behalf—and did so. During her reign, she worked with various prime ministers, saw her country and its empire through multiple wars, and presided over a nation coping with vast technological and social change. Reef is an accomplished biographer for young readers, and this is one of her best. Victoria’s personality comes through in the lively narrative, though Reef never shies from the public and personal controversies that Victoria brought on herself. All the necessary context for understanding her life and times is woven through without ever getting in the way. The text is enhanced by a plethora of contemporaneous illustrations, making this a handsome volume. The backmatter includes a list of British monarchs, family tree, extensive source notes, bibliography, and picture credits.